BARNSTABLE, Mass. /Massachusetts Newswire/ — The Fund for Animals Cape Wildlife Center and The Humane Society of the United States this week announced that they have co-presented Mass. State Rep. Brian Mannal (D Barnstable) and State Senator Daniel Wolf (D Harwich) with 2014 Humane Legislator Awards. HSUS President and CEO Wayne Pacelle presented the awards during Cape Wildlife Center’s “Wild for the Cape” fundraiser, held Aug. 2 at The Beach Club in Centerville. The event, underwritten by Barbara and Dave Birdsey, attracted more than 100 Cape Wildlife Center supporters. Rep. Mannal has established himself as a champion of humane legislation. He supported legislation to make it illegal for circuses and travelling shows to keep elephants constantly tethered by chains and to prevent the use of bull hooks and other pain-inflicting implements on the animals. He is a co-sponsor of the Massachusetts Prevention of Farm Animal Cruelty Act, a pending bill which would prevent calves and pigs from being confined in cruel veal or gestation crates, where they are helpless for months, unable to even turn around. And he has co-sponsored legislation to crack down on illegal hunting and to protect companion animals. Senator Wolf has been a long-time champion of protecting and preserving the wetlands and waterways and, like Rep. Mannal, is a co-sponsor of the Massachusetts Prevention of Farm Animal Cruelty Act. A third honoree, Adrienne Tashjian of Winchester, MA, received a Lifetime Achievement Award for her support of Cape Wildlife Center and The HSUS. Operated by The Fund for Animals in partnership with The Humane Society of the United States, Cape Wildlife Center, located in Barnstable, is one of Massachusetts’ largest wildlife rehabilitation centers. The 4.5 acre center rescues nearly 2,000 animals a year, representing more than 135 different species. The Center also offers intensive training to pre- and post-graduate veterinary students and practicing veterinarians from the United States and abroad; and educates rehabilitators, animal control officers and others integral to wildlife protection and preservation. 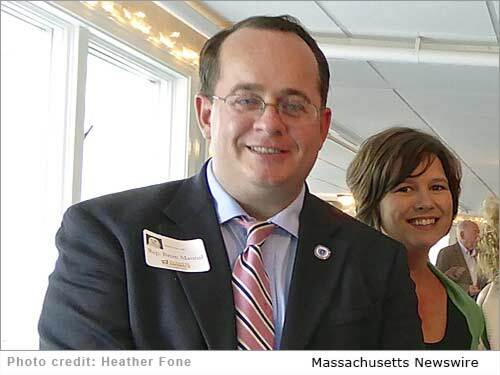 PHOTO: Rep. Brian Mannal and his wife, Sara, at Cape Wildlife Center’s “Wild for the Cape.” Photo by Heather Fone.